A cutting edge Porsche Centre Teesside has opened on Concorde Way, near Stockton, after a two-year search by privately owned franchise JCT600 to find the right local premises to showcase a range of stunning sports cars. A major investment in the Porsche brand and the Teesside community, the centre – which is focusing on serving customers across the North-East and North Yorkshire – is the newest in a 37-strong Porsche Centre network across the UK and Ireland. “As one of the most prestigious marques in the world, we are proud of our long-established relationship with Porsche,” said John Tordoff, chief executive of JCT600, the franchise motor firm that operates primarily in the north of England, with 50 dealerships between Boston and Newcastle. “Having spent two years searching for the right site on Teesside in which to showcase these stunning sports cars, we are pleased to have been able to find this high profile, accessible location which will complement our Leeds, Newcastle and Sheffield Porsche centres. 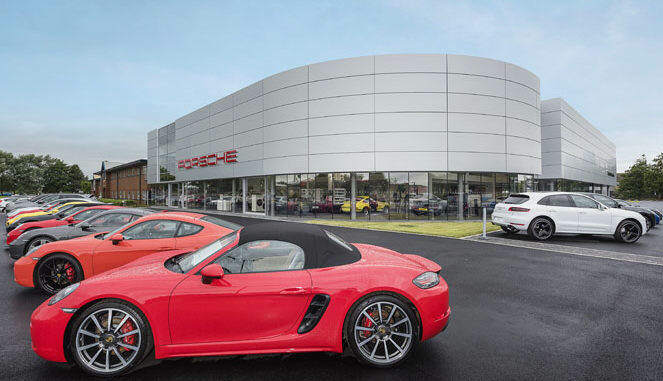 An eight-month redevelopment has culminated in a 35,707 sq ft showroom with the capacity for 15 new Porsches and 40 Porsche-approved pre-owned vehicles. The centre will offer the full range of Porsche services, including new and Porsche-approved pre-owned sales, servicing, parts, a service loan fleet and a full range of Porsche demonstrators. Local delivery and collection will ensure any servicing or repairs are conducted with minimal inconvenience to customers. Ross Jameson, the centre principal, said: “The new Porsche Centre Teesside is one of the most impressive and advanced Porsche centres in Europe. Its stunning look and new, state-of-the-art facilities are exemplary of Porsche’s brand and dedication to customer service. “We boast the only two-storey viewing area in the Porsche network for our Direct Dialogue Bay, which really is an exceptional experience for our customers.